Learn more about Fairfield real estate below! This charming community is located less than 20 minutes from downtown Durham and is especially popular for its proximity to the Research Triangle Park, Raleigh-Durham International Airport, and the University of North Carolina at Chapel Hill. Enjoy quiet, suburban living with great schools and shopping that's close to work and places to play. View all of the current homes for sale below or keep reading to learn more about Fairfield homes for sale and nearby lifestyle amenities. Fairfield homes for sale offer prospective buyers a selection of well-built single-family homes that are perfect for growing families, working couples, and retirees alike. This well-maintained community showcases beautifully landscaped frontages with healthy green lawns, all the while surrounded by a dense layer of towering heritage trees that add to the peaceful serenity of these neighborhoods. 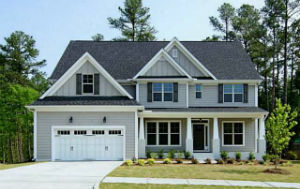 Houses here typically feature southern inspired architecture with a mix of rich red and brownstone and vinyl siding, and lots here are usually larger than average homesites in the area. These spacious lots offer a considerable amount of space both inside and out, which helps to accommodate the two-car garages and fenced backyards that are characteristic of this community. Development in the community began in the mid-1990s and continued up until 2014. Because of this, the age of the homes can widely range from just a few years to nearly 20. If you're in the market for a new home, you'll find many of these gorgeous new contemporary homes in the northwestern neighborhoods, surrounded by a soft cushion of preserved forest along picturesque streets. In Fairfield, you get the idyllic blend of small-town charm and gorgeous family homes with the convenience of big city amenities just a few minutes away. This thoughtfully planned residential community doesn't just include an array of fine move-up homes, there's also so fun family-friendly amenities right in the heart of the community for you to enjoy. The Fairfield Recreation Center includes a private pool, playground, beach volleyball court, tennis courts, and a private clubhouse. For all of your everyday shopping needs, the Streets at Southpoint and the Triangle Village Shopping Center are both just minutes down the road from Fairfield. You'll find a variety of the nation's top retailers and fast-food chains here as well as grocery stores, banks, and various services. To learn more about Fairfield real estate and to request a showing, contact the team at My NC Homes today! Send them a message online or give them a call at 919-659-6173.